The blocking Anticyclone is still with us and gave light and variable NE wind in the forecast. The Race Officer Robin Roebuck and his merry men set us an Easterly group 3 with course 2, West Narrows to starboard for the fourth and final race of this series. Len Cheshire set off first in Sweet Friday and beat down the fairway against the last of the flood tide. Next off at 1357 was “a little Trifle” who got a good line off the clubhouse end and managed to keep to the edge of the fairway. Popincoota sailing white sail and Aurora then started some two minutes later and held the same line. Eventually the two GK24s Wilkie and Kiamana started in conjunction with Deep Purple. By the end of the docks Trifle had got into the lead and managed to find a wind line inside Caldy buoy and on towards Trefusis buoy. Sweet Friday went south where there appeared to be more wind. Alas we looked skywards and there were two seagulls circling round a thermal at 500ft, soon our Windex mirrored their dance and we initiated a series of tacks trying to keep the boat moving and head in the general direction of the West Narrows. The wind filled in from the North leaving Len stranded and Trifle bowling along but very closely followed by Kiamana and Deep Purple. Trifle rounded the mark and set starboard pole kite. Both Kiamana and Deep Purple set their kites and went high towards Trefusis. We stayed low taking the straight line to the fairway thinking that the wind would stay more constant and the tide had turned giving a gentle nudge on our way. We passed the rest of the fleet still tacking up wind and as we approached the moored barges on Frigate and Caldy both Deep Purple and Kiamana had taken the lead from us. Popincoota under genoa was also bearing down very fast so a quick and early dump of the kite enabled us to luff up and keep third place around the turning mark. 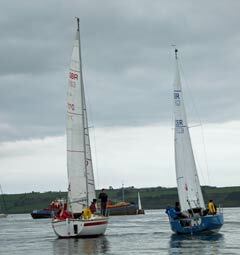 The course was shortened and we were sent off to round Trefusis to port and finish. Ron Jones in Deep Purple took a commanding lead away from the turning mark, while Trifle got buried beneath Kiamana and was forced to tack off thus allowing Popincoota to overtake. Wilkie then got a breeze and followed Trifle up to the Trefusis side. The pesky thermal, probably emanating from Tom Laity’s cow field was still there and the hole in the wind spread the boats in different directions. 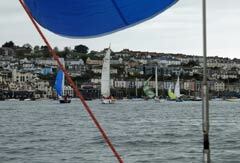 Kiamana sailed by Nigel Rowe rounded first and Trifle managed to sneak in behind him. Oh and Ron in Deep Purple? He should have gone to Specsavers as he went off towards the Vilt. 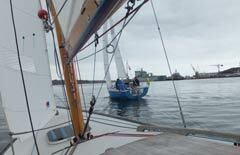 Duelling spinnakers to the end of the fairway ensued with Kiamana dumping all sorts of dirty air over Trifle. Popincoota was coming up very quickly behind. Kiamana got a massive header just off the barges and we managed to hold on and got a big lift. A quick hoist of the genoa and dump of our kite enable Trifle to luff Popincoota and hold the inside advantage near the moorings. Out of the ebb tide and with a good lift Trifle made the line with hardly a boat length to spare from Popincoota. Kiamana was third and Wilkie made fourth. Ron recovered well and beat Mandy Owens by a handspan taking 5th place with Len in the last slot less than a boat length behind. Overall Mandy Owens won the series with three wins. Trifle was second and Wilkie third. We had tea and cakes care of Polly Tregaskes and helpers. Thanks to Jeannette and Paul in the ops room and Giles for returning us to dry land.